Pigs in a Blanket with dijon mustard - I can't eat just one! The secret ingredient makes all the difference! I think pigs in a blanket are the perfect tailgating snack. They are bite sized and everyone loves them!. Especially me!! These are always the first thing to go at our tailgates. This recipe for pigs in a blanket it a little different from other recipes I've seen. It has Dijon mustard baked inside the rolls. I really think it makes a difference. Plus, it eliminates the need to have a dipping sauce. Here is a kitchen tip - I use a pizza cutter to cut the crescent rolls; makes cutting so much easier. 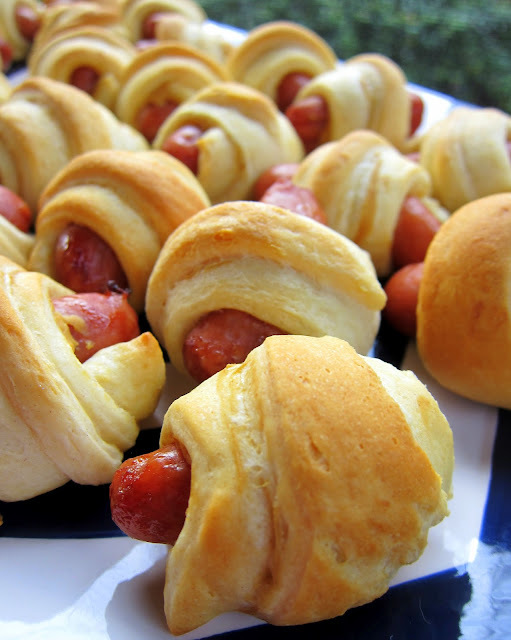 These pigs in a blanket are a real crowd pleaser. Serve them at your next gathering for an easy and delicious treat! Pigs in a Blanket - I can't eat just one! The secret ingredient makes all the difference! Unroll both cans of the dough; separate into 16 triangles. Spread a heaping teaspoon of Dijon mustard on each triangle. Cut each triangle lengthwise into 3 narrow triangles. I use to show up to the hunting camp with pigs in a blanket. The guys went wild over them. I do mine same way but with BBQ sauce! Love piggies in a blanket! looking for some good munchies for the game Sunday. Pigs in a blanket will be on the list! Who doesn't love pigs in a blanket. I need to do mini ones soon. I really do like these. Thanks for reminding me I need these for our Super Bowl party! I made these for the Cotton Bowl Friday night (Gig 'em Aggies!) and my boys loved them! They've both requested them for their lunch boxes this week. I love the addition of Dijon mustard! The last time I made these I used Conecuh sausage that I already had in the freezer and just cut them the length of little smokies. They were a hit!